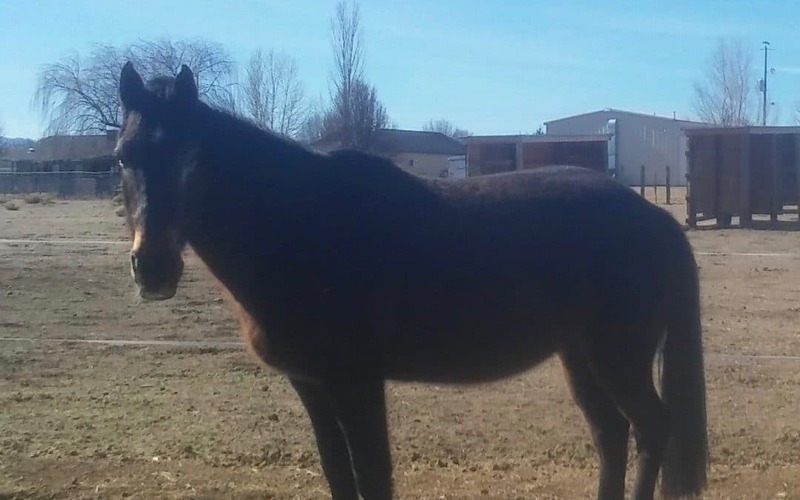 Callie a tall mid-twenties mare we were told was headed for slaughter 4 years ago in Montana. Later the folks who rescued her moved to AZ & fell on some hard times making her care difficult for them. In early Nov. 2017 they surrendered her to BMRS. Her name was Cassie when she arrived. We recently lost a big dark bay Thoroughbred named Allie who she reminded me of in many ways. Thus, inadvertently ‘Cassie’ became ‘Callie’. Tho she is solid dark bay, Callie is actually at least part Appaloosa. Her feet were in need of work which she is getting, Dr Fisher said it looked as if her teeth had never been done & she was pretty thin. Now on soaked pellets, rolled oats & Cool Calories she has gained enough weight that her ribs are no longer visible. She was a bit distant at first but is warming up a little more each day. Being a non-aggressive easy keeper, Callie would make a kind companion for any lonely solo steed.